Jazz is available in 3 different colors - Black, Gray Metallic and Blue. The Japanese automaker Honda is among those auto brands which sell their automobiles at a global platform. This company is well known for its powerful engines and striking features which are packed in high tensile frame (ACE) and are made available with an attractive label. Honda Jazz is also one of those productions of Honda which has made the company proud with its high sales. Launched back in 1982, Jazz is a mid-range hatchback with 5-seats in all and a big boot to swallow its occupants' luggage. In UAE, Jazz is available with the same appealing features and cutting edge technology for which Honda is known. Hop inside this Honda 5-seater and find a sophisticated interior welcoming you. The premium upholstery of this hatch gives it an elegant look. Check out its dual-tone dashboard and you will realize that this decently priced car has more than 'decent' features employed in a posh manner. With all the comfort factors, Jazz offers entertainment system also so that every jouney is enjoyable and fun. AUX/USB connectivity, MP3, CD player, AM/FM radio and 4 speakers are packed in this hatchback so that the passengers may enjoy crisp sound with the music of their choice. You also get a generous boot of 560 litres which is among the best in this segment vehicles. This family hatch has got a robust look with a broad front and stylish headlights. Furthermore, if you look at the front and side profiles of Honda Jazz, it would be difficult for you to ignore those artistic creases, body colored door handles and sophisticated door mirrors which, altogether, make it look stylish and worth purchasing. A panoramic sunroof in the EX trim adds more value to its aesthetics. Jazz looks quite large from its exterior, all thanks to its overall dimensions which measure 3900 mm x 1695 mm x 1525 mm (L x W x H) and 2500 mm at wheelbase. The minimum ground clearance counts to 150 mm which is decent for a family hatch. The LX trim comes with 15-inch alloy wheels having 175/65 R15 tires and the EX variant has 16-inch wheels along with tires measuring 185/65 R16 for appropriate grip. Honda Jazz is available in 2 trims – LX and EX with some distinction in features. Both of these trims pack a similar 1.5-litre engine under their bonnets. This 4 cylinders SOHC engine knocks out a maximum power output measuring 118 hp at 6600 rpm along with a maximum torque measuring 148 Nm at 4800 rpm. This petrol engine is mated with i-VTEC technology which makes it more efficient and adds to its performance. The acceleration and pick up of this hatchback proves the efficiency of this i-VTEC technology which makes it race from standstill to 100 kmph in just 11.5 seconds with a maximum speed of 190 kmph. With a fuel consumption of 6.9-litre/100 kms, this engine can be counted among economical engines. Both the trims of Honda Jazz are loaded with various safety aspects to protect its occupants. The ACE body structure of Jazz absorbs the energy after an impact and keep the occupants safe. Its dual front airbags for the safety of driver and front seat passenger prevent the occupants from hitting the vehicle body after a collision. 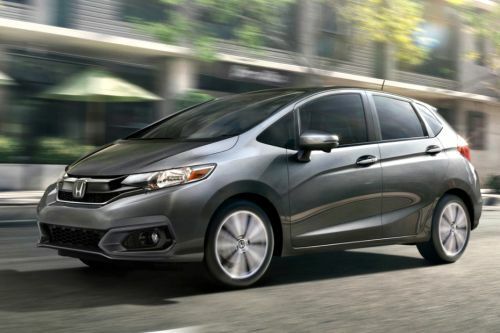 Honda has equipped its Jazz with Brake Assist, Electronic Brakeforce Distribution and Anti-Lock Braking System for a stable and controlled drive. Immobilizer and security alarm system provided with Jazz keeps it safe from any theft. Front wheels of this Honda vehicle has ventilated disc brakes and rear comes with drum brakes for efficient braking. McPherson strut front suspension and torsion beam axle rear suspension handles this hatch in an efficient manner. Honda Jazz is a decent hatchback with good safety features and appealing interior. Though, its petrol engine delivers a decent mileage which is required for any family vehicle, lack of diesel engine continues to be a negative. What is the price of Honda Jazz? On road prices of Honda Jazz EX in is costs at AED63,900 . What are the colors options available in Honda Jazz?